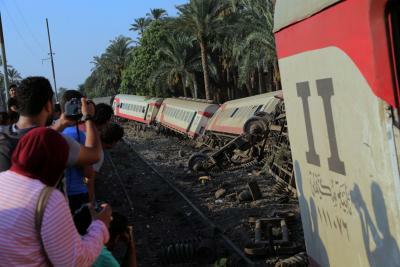 Cairo July 14 (IANS) At least 55 people were hurt on Friday in a train derailment in the province of Giza the Egyptian Health Ministry said. Three carriages of the southbound train left the tracks in the town of Badrashin the ministry said in a statement without offering any details on the reasons for the derailment. The injured were taken to several nearby hospitals. This is the first serious railway incident in Egypt since February when 10 people died in an accident in the town of Kom Hamada Efe reported. Egypt s worst-ever train tragedy was in 2002 when a fire broke out on a train traveling from Cairo to the southern city of Luxor leaving 376 people dead. Rail accidents are frequent in Egypt due to the poor condition of tracks and rolling stock and to the lack of a modern system of signaling and traffic control.